If you use public transportation to get around, your life is about to get just a little bit easier: Google Maps (iTunes, Android) has begun offering real-time public transit data for New York City and Salt Lake City, with more cities to come. For some time, New York City commuters have been able to track late train arrivals inside of subway stations – digital signage predicts how long you need to wait next train. Access to this real-time train data was made available to the public late last year; only now has the data been integrated into a mapping program like Google’s. For now, the up-to-the-minute schedules are only available for seven subway lines in New York – the 1, 2, 3, 4, 5, 6, and 42nd Street Shuttle. In Salt Lake City, riders will be alerted to delays in the city bus and tram system. Google has also made more general service alerts available to Washington D.C. commuters. What does this mean for the future? As more cities upgrade their mass transit infrastructure and real-time tracking abilities – a matter of when, not if – more real-time data will be available on Google Maps. And as more data becomes available, programming geniuses will be using it to make our lives more convenient. 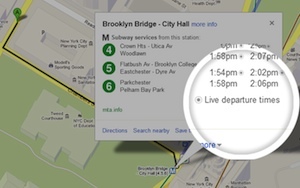 In the meantime, you’ll have to settle for the static schedules, fare information, and transit time estimates Google Maps already makes available for approximately 800 cities worldwide. How inconvenient life in 2013 is for the rest of us!